How did Jesus find the strength to endure and to keep depression at bay while people hated Him? ‘He entrusted Himself to Him who judges justly’ (v.23). He did this through praying alone often, very often! The Apostle Paul had a “thorn in the flesh” which was never directly identified for us in scripture, but whatever it was it involved suffering and embarrassment, a humbling of his pride. “… Therefore, in order to keep me from becoming conceited, I was given a thorn in my flesh, a messenger of Satan, to torment me. Three times I pleaded with the Lord to take it away from me. God said His grace would be sufficient for Paul, and no doubt this message was for us too when our trials are not solved right away; God’s grace will be sufficient for us in our trials, but what is happening when we are convinced that His grace really isn’t being enough for us? In my own life I have had a whole-body pain and fatigue condition that was diagnosed over 15 years ago, and has continued to increase over time. I am currently in bed about 18 hours every day, and some weeks I am unable to leave the house. There is no treatment for symptoms, there are no answers for medicinal or naturopathic healing, and traditional prescription pain medicine doesn’t work at this time (due to my body chemistry, since birth I have always been partially immune to most anesthetics and analgesics). There are days when the pain is almost worthy of a scream, the fatigue feels like I have a ton on my shoulders, and my world has become very, very small because I am usually unable to socialize. I miss Pastoring a local church, and I miss preaching, counseling, and visiting the sick. I believe in Divine healing through the Name of Jesus Christ, and yet… here I remain. So what about the grace of God? What about those who are convinced that God’s grace isn’t being sufficient for them? The problem isn’t with God, it’s with our perspective. It would be easy for me to think that God’s grace has failed me if I consider only certain outcomes to be the only proof of God’s grace being sufficient for me. But, I have learned that God’s grace really is sufficient for me if I allow Him to choose what kind of grace. For those who are suffering in trials and are convinced that God has left them out in the cold, they need to realize that God’s grace is provided to us for journeying through the trial, not just to end the trial. In my situation, if my measure of God’s grace is only compared with how far my pain goes down, I will be sorely disappointed. God’s grace doesn’t take my pain away (yet), His grace gives to me an internal fortitude and joy for continuing through life’s journey while in pain! If you are a believer in Christ and in the scriptures, there are specific things we know about God that are certain and factual, and one of those certainties is His faithfulness to His children to bring them through any storm that might come upon them. When we look around at our situation and we doubt God’s presence and participation in our circumstances, the problem is not with God, it is with our own perspective. God’s grace is sufficient for you in your trials, just allow Him to choose how His grace will benefit you. If His grace for you is miraculous healing, great! If His grace for you is medicinal healing, great! If His grace for you is endurance with an ability to suffer long and hard with a bright countenance of joy and peace… great!! Let God choose the form for His grace, and you choose to accept His brand of grace regardless of what that means. Pastor, has your Crown for Leadership become a Crown of Thorns? Were you voted-in by a 98% vote and highly regarded during the first seasons of your ministry, only to recently enter into a very dark time when some people are making things very difficult for you? Has your recognition as a Pastor been transformed into a recognition as an obstacle by some [cruel people] who want to see the ministry head in a different direction? If you are suffering because you are doing good, consider that Jesus Himself, the Perfect One, suffered in His ministry too. Our calling which comes from Him is not only to preach, teach, counsel, administrate, and to heal; it is also to demonstrate and model how to endure suffering by God’s provided grace. How did Jesus find the strength to endure and to keep depression at bay while people hated Him? “He entrusted Himself to Him who judges justly.” He did this through praying alone often, very often! Our Heavenly Father knew his servant named Job, and He was confident in the strength of the genuine love that his servant had for Him. The Devil was otherwise convinced, so he sought permission from God to test Job to the extreme. He was convinced that if Job was faced with the loss of all of God’s blessings of health, wealth, and family that he would embarrass God in word, action, or attitude for all of Heaven and Earth to witness. God told the Devil to take his best shot, all the way up to the brink of Job’s death. The Devil proceeded to destroy Job’s health, wealth, and family. And Job proceeded to remain true to God, glorifying Him and embarrassing the Devil by his words, actions, and attitudes, for all of Heaven and Earth to see. Are you experiencing a destruction and loss in your life that feels like it has come straight from the Devil’s hell? Are you being tested to the extreme? It sounds like our Heavenly Father knows you, and He is confident in the strength of your genuine love that you have for Him. It sounds like the Devil is convinced that if you are faced with the loss of God’s blessings in your life of health, wealth, and family that you will embarrass God in word, action, or in attitude, for all of Heaven and Earth to see. 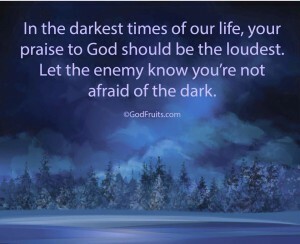 This is YOUR time to remain true to God, glorifying Him and embarrassing the Devil, for all of Heaven and Earth to see! This is YOUR time to let your genuine love for God shine brightly through your words, actions, and attitudes. Job’s time of extreme testing came to a close, and the flow of God’s blessings of health, wealth, and family were restored. YOUR time of extreme testing will also come to a close, and the flow of God’s blessings of health, wealth, and family will be restored to YOUR life too! I have found the scriptures to be absolutely true when the Lord told the Apostle Paul [who was being tormented by a “thorn in the flesh“] that God’s grace would be sufficient for his journey of suffering and pain. While I suffer with chronic pain (and sometimes outright agony), I am at the same time blessed by God’s chronic grace (if I may phrase it that way) which is more real to me than even the pain. In a sense, the pain is almost surreal, but God’s grace is so real, and is provided through His tangible Presence! His grace does not take my pain away. His grace does however equip me physically, emotionally, psychologically, and spiritually to endure the pain, and to do so with a heart that is filled with joy and is established in peace… His peace! If you suffer with a chronic pain condition of some kind, pray for healing, and also pray for the “chronic” grace of God to sustain you until His healing arrives in your life. See you at the altar, my friend, where we together will approach our gracious Heavenly Father Who will provide all that we need!